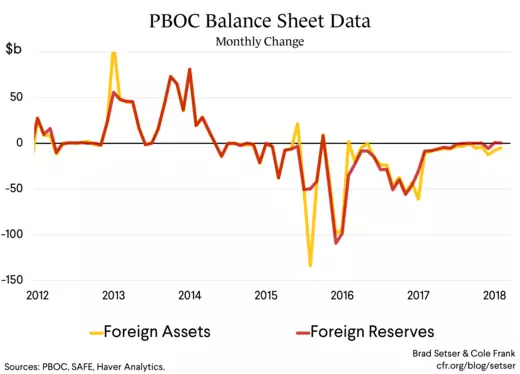 China just released the PBOC balance sheet data for February. No sign of any real intervention—no real purchases, no real sales. The last significant sales occurred in December of 2016 and January of 2017. The era of Chinese sales is fading—even from the trailing 12 month sum. The BOP data for 2017 actually shows $90 billion of purchases. Looking back, it is striking to me how sudden the swing in China's reserves was. Up until early 2014 the PBOC was a large net buyer of foreign exchange in the market. 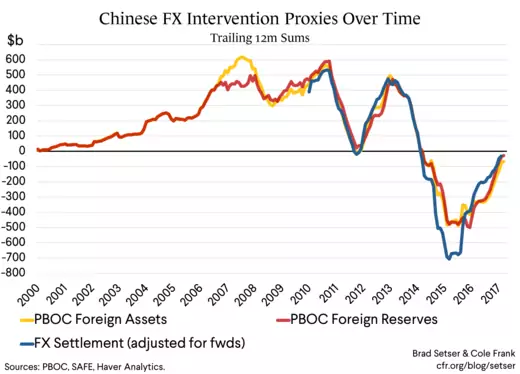 But with the devaluation China essentially moved from accumulating reserves at a pace the world had never really seen in the past (outside of China that is) to selling reserves at a pace the world had never really seen over a 24 month period. And now it appears that China—and the world—have entered a new era, one where inflows and outflows roughly balance, and thus China is no longer a big net buyer, nor a big net seller. To be sure, I think China’s state is still accumulating foreign assets—but the growth is coming through increased lending by Chinese state and policy banks to the world, not through large (net) purchases of bonds by State Administration of Foreign Exchange (SAFE). And there is clearly a flow story that goes with the dollar’s 2014 appreciation (and the fall in the euro and the yen). Europeans start buying a lot of bonds issued by the rest of the world around then (a topic Benoit Cœuré has covered at length). And private Japanese demand for long-term bonds also picks up—there is a notable uptick in purchases by non-bank financial intermediaries (mostly insurers) around 2014. The cumulative outflow (e.g. net purchases of foreign bonds by residents) from Europe and Japan since 2014 is now reaching Chinese-reserves-before-the-global-crisis kind of levels. 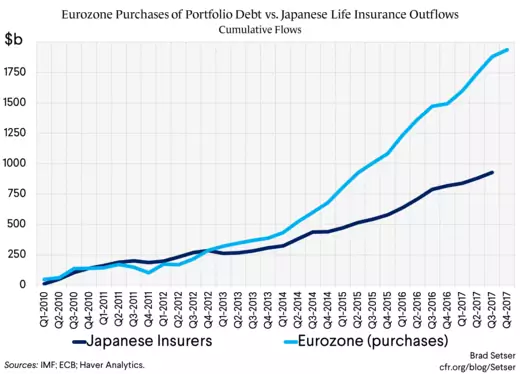 Since the start of 2014, Eurozone residents and Japanese financial institutions have added about $2 trillion in foreign bonds to their portfolio. And something similar has happened in Korea and Taiwan. Outflows from insurers (and more recently banks) has picked up—encouraged, I suspect, by regulators who have relaxed prudential limits on foreign currency exposure. * China did sell reserves in the first quarter of 2015, as the PBOC guided the yuan down a bit against the dollar. But those sales largely stopped in the second quarter of 2015, when the PBOC held the yuan stable. ** In my view, that appreciation held back U.S. growth in both 2015 and 2016. Net exports were a meaningful drag on the economy at a time when the economy still wasn’t at full employment. *** Largely because China and Japan aren’t intervening. The smaller Asian economies still intervene fairly significantly. Singapore and Thailand have been intervening heavily. 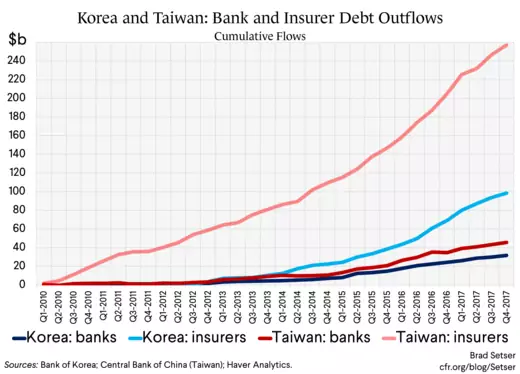 And I think the intervention done by Korea and Taiwan has an outsized impact, in part because it signals to domestic institutions that the central bank will cap appreciation of the KRW and TWD at a certain level and thus the currency risk associated with holding a foreign bond heavy portfolio is manageable. But that’s a subject for another day. 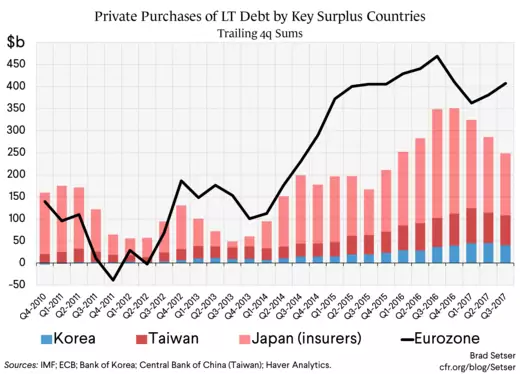 The bulk of the outflow needed to sustain the large surpluses of Korea and Taiwan now comes from regulated, but private, institutions—not each countries’ central bank. Korea’s national pension service has also been a big buyer of foreign assets, particularly equities.